They say a picture paints a thousand words. 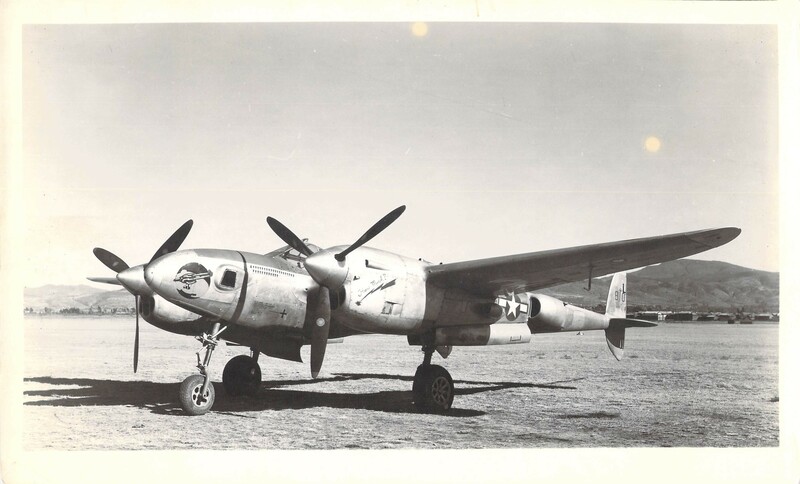 This one may not paint that many, but it does reveal a number of interesting aspects about the 35th Photo Reconnaissance Squadron’s primary aircraft in overseas service during World War II. There is no serial number seen on the tail of the aircraft as was common for other USAAF aircraft. Instead, a three digit squadron code number is depicted, number “810.” According to a listing of 35PRS aircraft tail numbers in a Mission Summary document in the 35PRS squadron history of July, 1945, tail number 810 correlated to F-5E serial number 610. This indicates that the full serial number for this aircraft is 43-28610, a P-38J-15-LO modified into an F-5E-2-LO. How this F-5E was transported from the U.S. to overseas is a bit of a mystery, presumably by ship, but it probably arrived in India in the summer of 1944 and was prepared for service. The aircraft was flown over the Hump into China for operational service, which appears to be indicated by a mountain-like mission symbol at upper left, below and in front of the cockpit. This Hump symbol is followed by two rows of photo mission symbols (indicating 32 missions total) painted like an old style camera. National insignia appear to be normal on this natural metal finished aircraft. There don’t appear to be any squadron-unique color bands, spinners or stripes on the aircraft. However, the 35PRS Redhawk emblem is prominent on the nose of the aircraft. Also of note is the writing on the left engine, “How Much?” written over what appears to be a stylized lightning bolt striking something. The meaning of this is unknown. The ultimate fate of this aircraft is also unknown to the writer of this blog. As always, appreciate any feedback to help with such matters. And there is a description of a picture, in less than a thousand words!